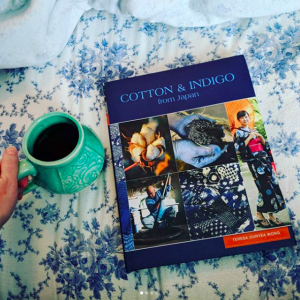 I received a copy of Cotton & Indigo from Japan , by Teresa Duryea Wong for review. I initially wrote a review that said, “Very cool book with gorgeous pictures and a lot of interesting history. This is worth picking up if the subject interests you. I appreciate it as both an informative book and simply as a pretty coffee table book.” But last night I got the chance to go through the book with my aunt, who is a big quilter and worked many years in a fabric shop, largely for the love of it. Hearing her ooh-and ahh, lovingly touch some of the photos, and tell me, “This is a great book, really thorough about the terminology and regionality.” confirmed what I already knew. This is a book worth having. It has two Forsythe seals of approval. This entry was posted in books/book review and tagged non-fiction on February 17, 2018 by Sadie.